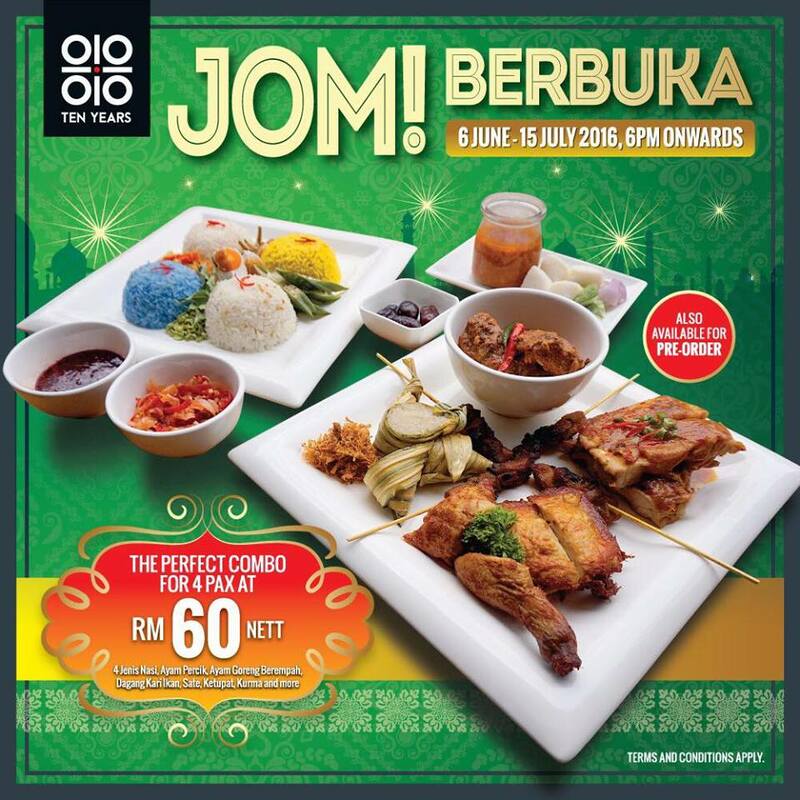 Malaysian Perfect Combo Menu this Ramadan at 10 Years Restaurant. In the recent years, many local foods are slowly disappearing due to the modern influences. Younger generation prefers trend over traditional resulting in lesser authentic local food business in Malaysia. From the 60’s leading up to the 90’s, Malaysian food culture has been losing its taste of authenticity due to changes of trends. Ten Years is a restaurant that brings popular local foods from every corner of Malaysia under one roof. Ten Years officially launched on the 17th September 2015 in Sri Petaling. Their logo – 4 “10” and a red dot in the middle representing connecting people from 4 different decades through food. Ensuring the new generations to come and be able to enjoy these local and traditional delicacies, Ten Years team took the effort to hunt down what are the popular food in every state of Malaysia. There are 3 conditions in order for a food to be considered as their signature dish in the restaurant. First, high rating in social media and endorsed by TV media. Second, has proven track record with long queue. Third, must have historic figure (been operating for more than 10 years) and state representative. There are currently 8 signature recipes from few famous road side hawkers such as Nancy’s Kitchen Nyonya Laksa from Malacca, Nasi Lemak Panas Yati from Petaling Jaya, Nasi Dagang Kak Pah from Kuala Terengganu and others. Apart from the 8 signature dishes, Ten Years also created their own menu with strong local influence such as Grilled Chicken Percik Sauce, Prawn Curry Carbonara, ‘Ang Mo’ Kat Chai and many more. This is the fusion menu that are so unique in this restaurant. I'm look foward to try the Asam Pedas Steak on my next visit to this restaurant. Its so Malaysian-LAH! Their dining area also resemble each decades from the 60’s, 70’s, 80’s and 90’s, allowing the patrons to indulge in the different themes while enjoying their meal. Ten Years was started off with a dream to preserve Malaysian food culture by passing it on to the next generation and knowing the importance to safeguard the food culture heritage. Ten Years wants the locals to enjoy the traditional recipe without the hassle of travelling. Lastly, Ten Years do offers venue for private functions, corporate meeting or gathering, and other occasions/celebrations. This Ramadhan, 10 Years brought the special menu for their customer and it is a perfect comb for 4pax that only cost only RM60 nett! Duration : 6 June - 15 July 2016. 6pm onwards, daily. Uniqueness of Ten Years Ramadhan Combo : A perfect combination of Most Famous Malaysian Cuisines from different states such as Kak Tum Nasi Kuning, Kak Pah Nasi Dagang, Kak Yati Nasi Lemak and Kelantan Nasi Kerabu. This Ramadan combo set is also Inspired by Ten Years logo. You can see that it plated as the logo. And in this combo you can have Nasi Kuning, Nasi Lemak, Nasi Dagang, Nasi Kerabu, Chicken with Percik Sauce, Fried Chicken, Fish Curry, Chicken Satay, Rice Cake, Red Onion, Cucumber, Ketupat Palas, Serunding Ikan and etc. With so many menu in the combo, your break fasting should be complete. Other than this Ramadan Combo, you also can have other specialty menu in 10 Years restaurant. · One of the best prawn mee in Pulau Pinang, which always sold out in the early morning, the store on Jalan Cheong Fatt Sze has 50 years long of history behind it, being the heir and second generation to the T&T prawn mee on Lorong Selamat. It specializes in its traditional tastes, with a broth boiled for hours which complements the other ingredients. · Char Kuey Teow is a mainstay of Pulau Pinang, but this popular char kuey teow store, which has been in business for over 60 years, is highly rated by visitors and Penangites alike due to its ability to maintain the same flavor and taste, even after 2 generations. · There’s always a long queue at Nancy’s Kitchen which already tells you the gastronomic satisfaction that awaits you. Her best seller, Nyonya Laksa with 20 years history over 3 generations, has made it to the top of the list of must-try food in Melaka. · This particular Indian Rojak, otherwise known as Pasembur Rojak, has attached many from near and far. The stall’s second generation operator Abu, is proud to have taken over the business that has been in esistence for more than 30 years. · Blue Pea Flower “Bunga Telang” served with fresh vegetables with our home special sambal bawang and not forgetting the Ayam Percik. One of the fusion menu in the restaurant, the Carbonara sauce were added with a taste of curry and turmeric. It does great to our Malaysian taste buds. This Linguine Chicken Sambal Tomato taste like a marinara but a little bit spicy and of course its for our Malaysian who loves spicy food. Good news to all foodie, 10 Years are making a Gift Card Promotion! · Customer can walk-in to buy the Gift Card at the respective outlet until 15 Jun 2016 only. You will get a RM100 gift card with a price of RM80 only! · As the gift card will be expired on 7 July 2016. So hurry up and go buy the card and enjoy their food! · Customer can't buy and use in the same day. 1. "This Ten Years Gift Card (”Card”) is issued in Malaysian Ringgit with a face value of RM100 only." 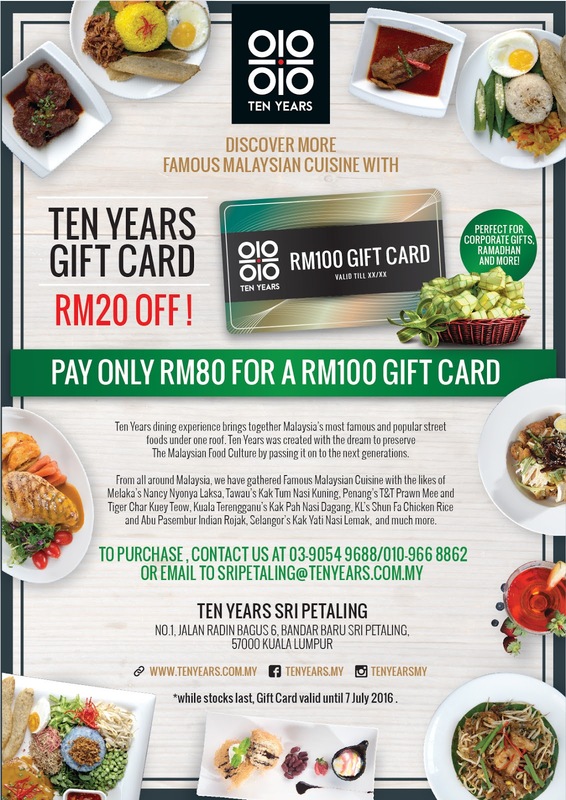 2.The Card can only be redeemed in a single transaction at Ten Years Sri Petaling Or Evolve Concept Mall (stated in the gift card's T&C),until the date of expiry printed on the Card. If the purchase is less than the value of the Card, no refund shall be made to the holder of the Card. Likewise, if the purchase exceeds the value of this Card, the difference shall be paid by the holder of the Card. 3.The Card is not exchangeable for cash or any other form of legal tender. The redeemed Card is not returnable. 4.Only original Cards are accepted. Amended, damaged, defaced or photocopied Cards are invalid and not acceptable. Ten Years shall not be responsible for any loss or damage of this Card and no replacement shall be provided. 5. "The Card is not applicable for any on-going promotions, discounts or offers." 6.The Card must be presented to the cashier upon making payment. 7.Ten Years Management reserves the right to substitute any of the Cards with those of similar value without any prior notice. 8.Ten Years Management reserves the right to omit, add or amend the Terms and Conditions hereof from time to time without prior notice. Any new or amended Terms and Conditions will supersede the existing Terms and Conditions with immediate effect." G08, Ground Floor, Evolve Concept Mall, Jalan PJU 1A/4, Ara Damansara, 47301 Petaling Jaya, Selangor. Last but not least, thank you Food Ink for the invites, it was a fun and great food review session. Thank you again! kenapa baca time2 sekarang ni... adeh ! Hmm.. the Ramadhan combo.. the meat portion doesn't look enough for 4 people.but the tiger char kueh tiaw looks yummy! Nasi Kerabu looks delicious. Will try it out soon. wow nice food, i am so hungry now. Yummy food with good company definitely the best way to buka puasa! The food looks good, making me miss the ramadan buffet I have enjoy last month! Ramadan means festive mood all over. This food seems to be a great choice to break the fast. Price is so affordable too. Wow~this place just near my house ~ will go there try their food! Looks so tempting! The Prawn Curry Carbonara caught my attention! yum yum,.. good local cuisine there! Hey. The price is quite ok and the portion is good too. Value for money I would say! Thanks for sharing. love their creativity! the combo rice plate really can help me solve my indecisive problem. now i can have 4 rice at a plate!!! woohoo!!! I agree with you that Malaysian Local food is not visible since the young people love different type of food. Thanks to 10 years , we able enjoy the authentic local food. Just near my office only!! !would like to try it after knock off!!! I know this reataurant. But never been. Should give it a try now. Thanks for the review. Wow they have so many local food that I love. I am tempted to try their Nasi Kerabu and Prawn Mee. Just went to 10 Years Restaurant last week and the food is pretty good. Like the ambience too.